Isn’t this ice cream sundae cute? It is from a set called Decadent Desserts. Laurie started with a image with pickles instead of bananas and called the set Crazy Cravings! I suggested that she also create a set changing the pickles to bananas which would appeal to more people. Don’t you love it? If you notice, I shaded the glass dish to look like the ice cream shows through a bit. Laurie is having a sale this weekend! Visit Doodle Pantry for all the details. Next postCongrats on Your Pregnancy Easel Card for the OCC. Gorgeous! You make me wanna have a banana split! Lovely colors, great shading technique. Mmmmm, yum yum!! That is some DIVINE coloring girl! Such a totally SWEEt card! I'm finally able to comment! Wahoo! 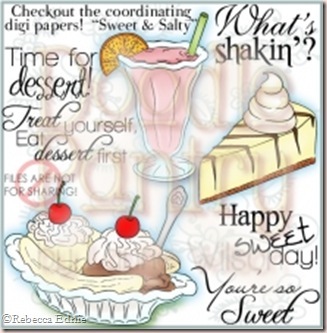 Your card is adorable – so sweet! Thanks for sharing – I haven't used this image yet, but I think I will soon 🙂 Hugs! Yum is right! 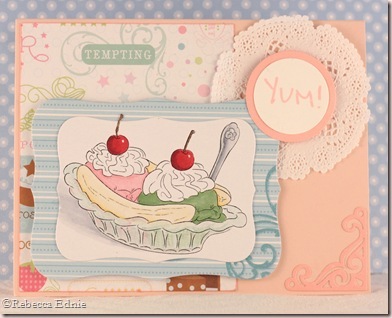 This is such a yummy looking card. love your colors and your coloring is fab! Wonderful coloring, Rebecca. Love the 'clear' glass. Awesome card.